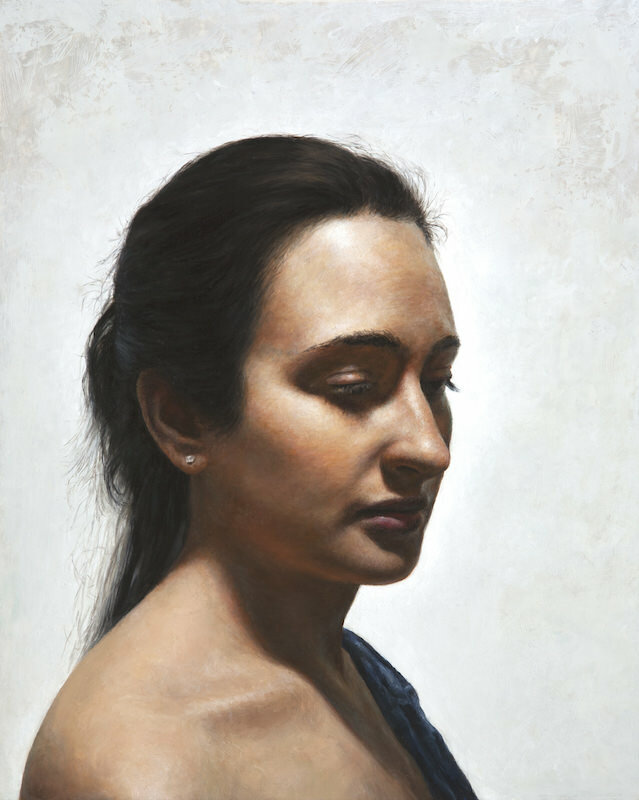 Costa Vavagiakis, Miranda XII, oil on panel, 13 x 10½ in. Do students who pursue realistic training today have more resources than did your generation of art students in the 1970s? I don’t have an academic art background. When I graduated from high school, there wasn’t really a good representational or realistic program anywhere. I decided to do it on my own. I’m basically an autodidact who developed intuitively. My first teacher was Max Ginsburg. Day one, ninth grade, first class at the High School of Art & Design, he asked a student to get up on a desk and pose, and we drew from life. That was it. I also studied there with Irwin Greenberg and joined the Old Hat Club, a painting group at the school that met early in the morning, before classes began. I was hooked immediately. Max and Irwin would paint alongside the students with a live model posing. Once or twice a day, during the session, they would go around and offer crits. We would stop and look at their paintings. It was a classic atelier situation, which is the absolute best way to learn. I have private students in my studio, and I’ve observed that in this environment they get good so fast. We learned commitment, discipline, how to organize materials at workstations, how to concentrate fully on a task and effectively represent the models before us. Max, in particular, would teach us how to be organized, how to be efficient, and how to have a clean lab, so to speak. A clean lab is an efficient lab. That’s where I got a lot of that early training. I didn’t go to college. 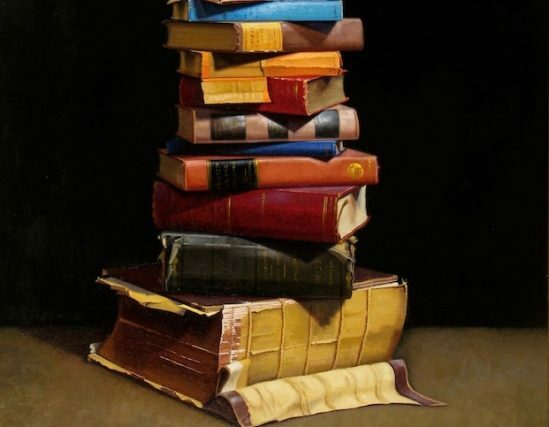 I had scholarships for one year or two years at both the Art Students League and the National Academy. 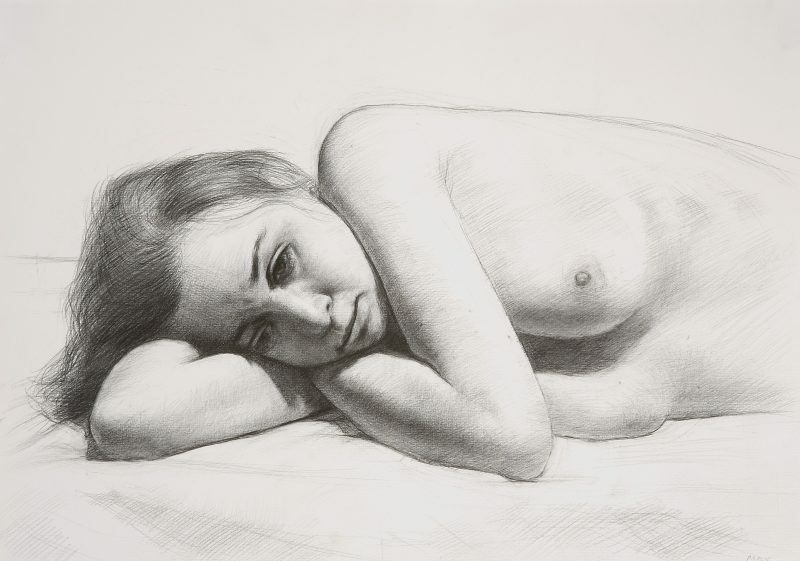 I took Harvey Dinnerstein’s class at the National Academy. My work then was very loose and open-ended. I remember Harvey saying, when he first saw my work, that I painted like a young Burt Silverman. He hooked me up with Burt. I showed him my work, and he gave me a scholarship for a semester in his private classes that he held in his townhouse. Burt taught me how to be liquid and open-ended. He is himself a very open-ended artist. Costa Vavagiakis, Rainbow XXXVII, oil on panel, 14 x 12 in. I did the absolute worst work that semester. I had learned to paint from life in one particular way. Burt would all of the sudden change the light source. I couldn’t deal with it. He was, in a way, visual and conceptual, working as much from visual observation as from his knowledge. He could adapt to things much easier, while, initially, I was totally lost. I did only a handful of fairly good works during that whole semester. Years later, I realized that I learned so much struggling in that short period with Burt. After that, I was on my own. I created my own curriculum, basically painting all the time. I was very disciplined. Even though I studied with some instructors early on, I consider my education more autodidactic because from the time I was twenty, I was on my own. When you’re on your own, the independence is, in a way, a prerequisite for ingenuity, and that’s the key to developing your personal vision. SC So you never depended on any pre-existing structure. You felt confident creating your own. CV Right. In a way, that is how teaching has been for me. I didn’t start teaching until my late 30s. By that time, I had started clarifying my vision. The “why,” for me, comes after the “how.” Upon reflection, I realized, for instance, that I was doing these sculptural effigies because of my response to Greek sculpture. I didn’t realize it until I looked back. The teaching for me is similar to how I do my work: it is always evolving. My methodology continues to be a work in progress. I’m discovering things as I’m teaching. SC You said that after your studies with Burt Silverman, you became a painter who could adapt more easily. Yet, your own studio setup appears to have a very controlled artificial lighting situation. CV It’s artificial, and it is a particular lighting, but it is constantly changing. If you look in my studio now, I have every possible light and contraption because I’m constantly experimenting. If it is controlled, it’s controlled only for the moment. When people look at my work, they think that it reveals a control thing. As a teacher, I’m known for being a tyrant as far as efficiency with materials. But I don’t really dictate policy on how somebody paints, or even which paints they use. Their dock could be in any order. I just strongly suggest that they keep the order the same. While I have my own list for an outdoor painting palette or a figure painting palette, I don’t require either of the student. What I do require is a one-hundred-percent commitment when they are in a class. SC Commitment is showing up and working efficiently in your clean lab? CV It is being responsive, being alert, being connected, being present. That’s the main requirement, being present, giving one-hundred percent because the class motto is always working toward the pursuit of excellence. My artistic vision requires that discipline, patience, and protocol. I couldn’t do these sculptural, highly volumetric images if I wasn’t systematic and patient. In class, when I’m teaching, contrary to my usual low voice, I speak loudly so others can hear. 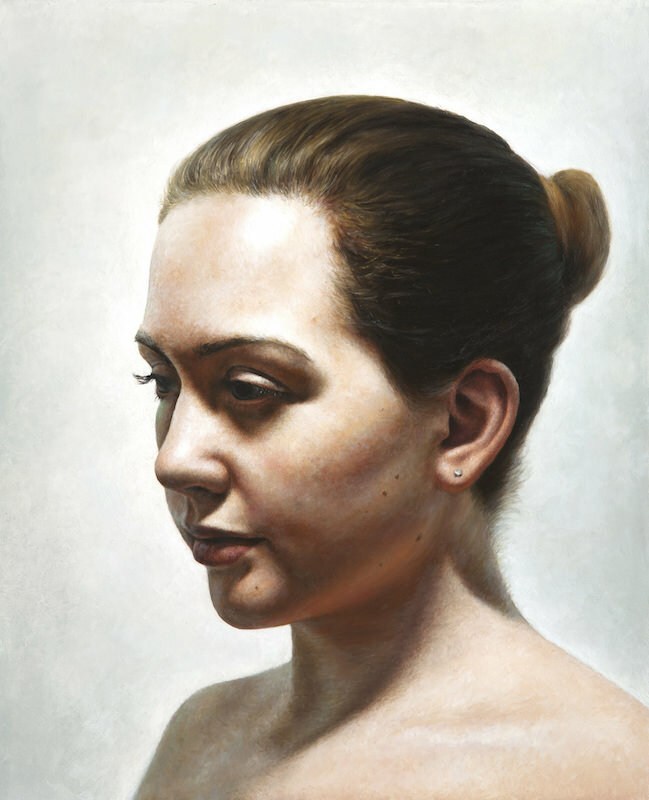 Students, whether beginning, intermediate, or advanced, are tackling the same technical issues in representational art. We’re all in it together. I do informal demonstrations and lectures during class, and students know that nothing is private. The other reason I intentionally project when speaking is that I don’t want a cult-like culture to develop. When you whisper to a student, the power of the teacher is so strong that people in the class might wonder what they’re missing. I try to be as egalitarian possible. I don’t teach a style, per se, and I don’t want the pressure of an entourage of followers who paint like I do. To my mind, it’s unethical to have a cult follow me. Costa Vavagiakis, Gioia VIII, oil on panel, 56 x 35 in. SC What are some things about art and art-making you did not learn until leaving art school? Are there things one simply cannot learn in any art school, or that you, the instructor, can’t teach? CV Teachers teach like they wish they were taught. SC It is absolutely true. Their approach is informed by the gaps in the knowledge that they figure out after they have left school. CV I’m an intuitive person, and my teachers were pretty intuitive. Even though many things were shown there was little necessarily explained. Part of process requires improvisation. Painting outside—what they call nowadays plein-air we used to call “on-the-spot” painting—is not a controlled environment. You have to deal with all the elements, and you learn ingenuity. You can’t blame the model; you just have to deal. It teaches you how to rig things and how to solve problems in different ways. I try different things because of an innate restlessness. It is a general art spirit thing. You’re not working for production; you’re working for creativity. In the studio, it is constant discovery. In teaching, that’s also what it is. I’m always learning. People look at my work and think it’s controlled. But I don’t work the same way all the time. I use different paint. I try different things. SC So while ingenuity might start with the materials, it expands to involve your whole set-up, the light and all the circumstances of your painting—outside or indoors. CV Definitely. I used the analogy of a lab, which you can take a step further. Most discoveries are mistakes. But you would not get to those discoveries if you didn’t go through a solid protocol. You need an organized lab to work. You have to set yourself up in a position to be able to discover things. The end is discovery; the means are experimentation and exploring. SC How do you find that level of organization with a full classroom of students of different abilities, each of whom brings individual preferences and habits from other classes? 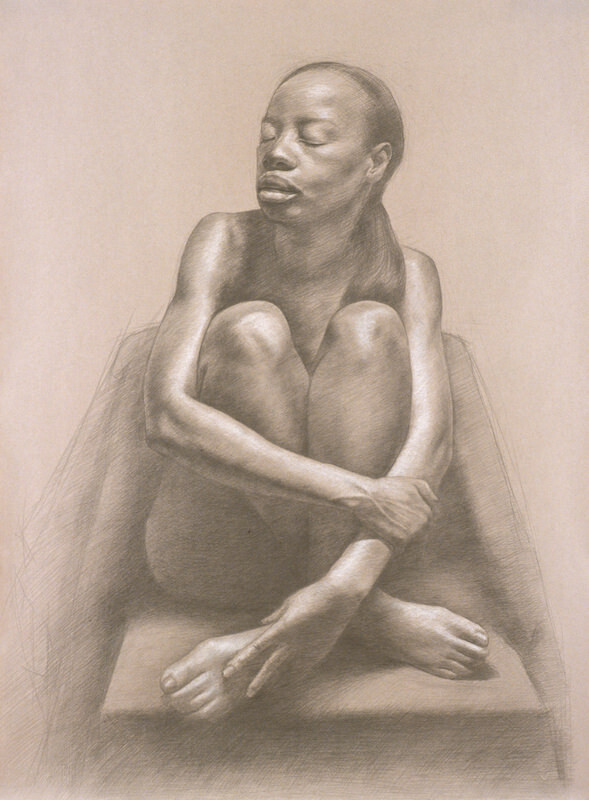 Costa Vavagiakis, Connie XVI, graphite and white chalk on paper, 25½ x 19 in. CV These challenges are not totally solvable. I put a lot of pressure on myself because I’m always in pursuit of excellence. That same diligence is there in the classroom with students. I’d be bored if it wasn’t. I have two full back-to-back classes in adjoining studios. Studio 1 has a sketch format: let’s say, poses in 1-minute, 2-minute, 5-minute variations, building up to a one-session pose on Friday. Studio 2 is a long three-week pose. They’re interdependent. I tell students that a twenty-minute sketch could be twenty one-minute loop drawings. You’re looping because you’re constantly assessing the gestalt. That’s the only way that I know how to make something become highly- developed and “real” and to keep the proportions and rhythms alive without sucking the lifeblood out of it. And it’s based on the sketch. I don’t have a materials list for the sketching class. Why? I don’t want to control everything. There are so many variables to sketching materials. I don’t want to pigeonhole people. When you control all the variables, then you can answer the questions easier. It’s predict- able. When you don’t, it’s more difficult to run a class. I get exhausted doing it, but for me that’s the only right way to do it. SC You like the different permutations of materials students come up with. CV Yes, so as long as you’re organized and efficient, streamlined, focused, and you’re one-hundred percent. When you don’t control the materials list, it is so unpredictable and there’s no one answer. You have to test it out and see. The one thing that you can never teach is the tactile component of a material. You just can’t. In fact, there is nothing written in manuals. How would you even describe it? In painting manuals that describe the oxidation of paint, they use the terms “open” and “closed.” When paint is wet and pre-oxidized, it is open; when paint dries, it’s closed or closing. But that is not an actual physical definition. I describe it physically as “the painting is pulling” because that is what it feels like. How are you going to describe traction, you know, the grab? You can’t describe it, and you can’t even see it in video tutorials. You have to feel it yourself. That is one technical thing that you cannot really teach because the student or the artist has to do it themselves. For artists, both the visual and the tactile are important. Costa Vavagiakis, Vania V, graphite on paper, 29 x 23 in. SC So you don’t even try broach the subject of the tactile experience of materials with students? CV We talk about the visual and the tactile all the time. Leonardo spoke about observing objects optically. He was talking about how objects appear. When we’re looking at any object, what we’re actually doing is enveloping it, our eyes constantly moving around it. So the viewer’s gaze is always enveloping and always moving. SC That needs to be trained? CV Seeing is automatic and involuntary, but an artist needs to notice. Drawing is basically navigating. The line is both a distance and a trajectory. I train people to be aware of what one does naturally. SC The terminology becomes a shorthand that might guide people in the wrong direction. It can also be dismissive. CV It is just a bias. It is anti-Socratic, and anything anti-Socratic means you are debating and not deliberating. If you don’t deliberate, you’re not going to get to any truth. These things are very important. Language is very important to me when I teach. There are now a lot more people with better chops as representational artists than when I was a student in the 1970s, no question. This isn’t because of the universities but the atelier programs. Its councils are full of Legislators no charlatan can fool. The same is true for visual artists. The first step in an artist’s development is the initiation. The next step is searching one’s vision. But then, the last long step, is clarifying one’s vision. That’s what we do throughout our lives. Artists’ work is constantly evolving. 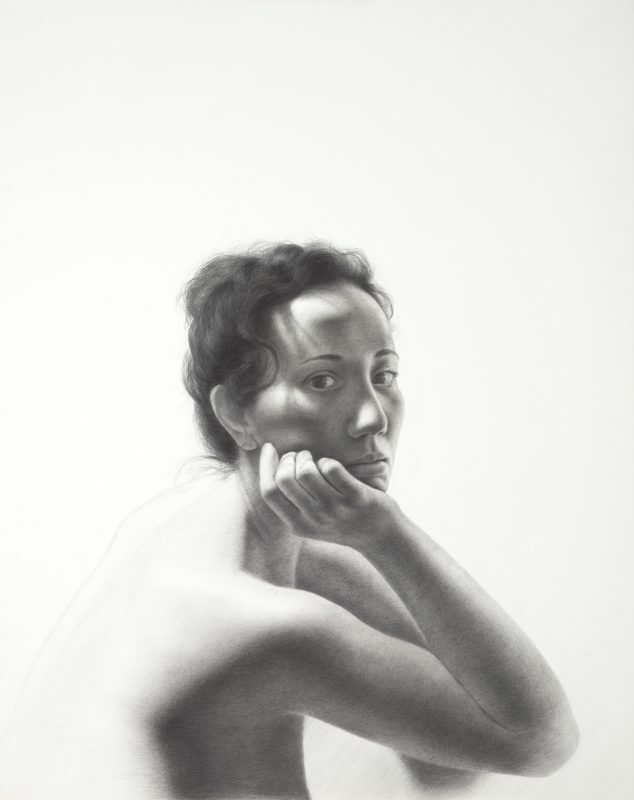 Costa Vavagiakis, Maria X, graphite on paper, 11¾ x 16 in. The three aspects of a student’s development are talent, focus, and endurance. Beyond just the economic factors you face after leaving school is the most important challenge: the ability to be alone. Every art student should read Rilke’s Letters to a Young Poet. This is the running theme of that book. SC Are there things you cannot learn in art school? CV The most important thing we learn at school is the fact that the most important things can’t be taught in school. It’s true, right? CV The student is so obsessed with not knowing, because, of course, knowledge is very important. But learning to get comfortable with not knowing is one of the last stages of an artist’s development. That’s how you start to develop the habit of questioning and seeking, which can propel and sustain you outside the classroom. But that stage comes later. SC What role does imagination play in the work of a realistic painter? CV I’ve always liked what Ben Shahn said in The Shape of Content (1957): “Craft is the discipline that feeds the spirit.” It’s very important, but the downside can be orthodoxy. 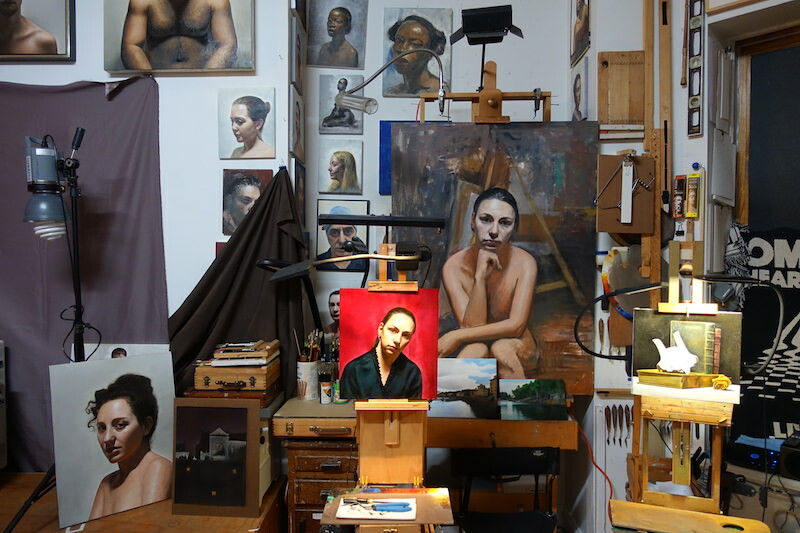 There are a lot of people today who make very solid representational images, but the question is, how many artists from these ateliers find a personal vision? Not a lot. There should be more independent thought. 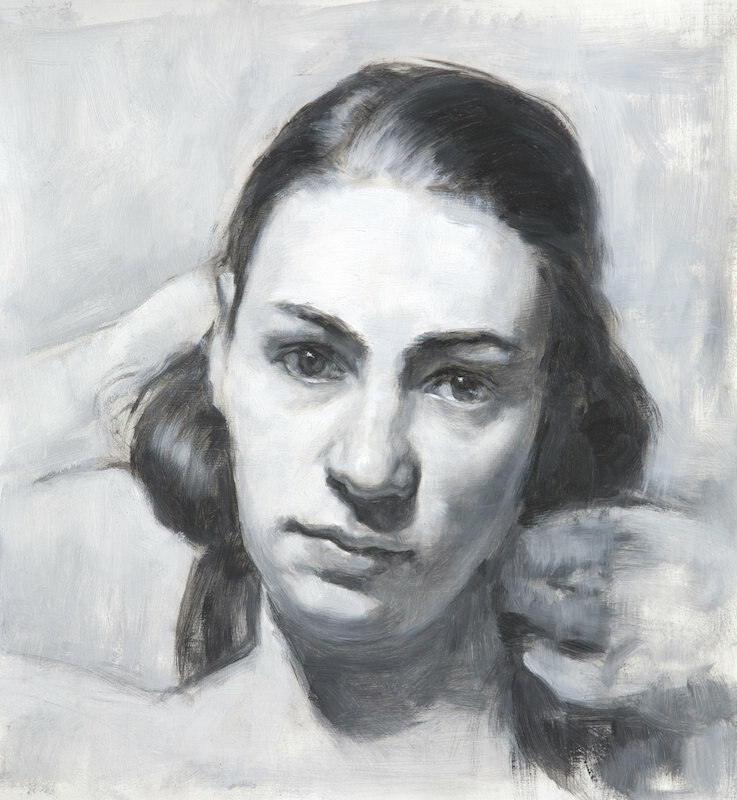 Costa Vavagiakis, Darya XXI, oil on panel, 13 x 12 in. More and more I realize that what distinguishes the good artist from the truly great artist is visual intelligence. Intelligence requires questioning, that’s why I put my faith in Socratic deliberation, not orthodoxy and dogma. Imagination is the necessary prerequisite for any type of pictorial art whether representational, semi-representational, or abstract. Our mind’s eye is constantly filled by our eyes. We process, decipher, and then transcribe our visual thoughts, whatever they are. Imagination plays into how an artist interprets and expresses him or herself not only in what they choose to depict but how they depict it. SC So the individuality expresses itself whether you want it to or not. CV The idea of the realist painter lacking imagination is a misnomer. The realist artist, when viewing nature, is not only describing but also selecting. The artist thinks what to say of the image viewed and how to say it. You can’t help but express yourself. That’s involuntary. You just have to keep the channels open.